In 1937 the Maserati brothers sold their company to industrialist Adolfo Orsi. 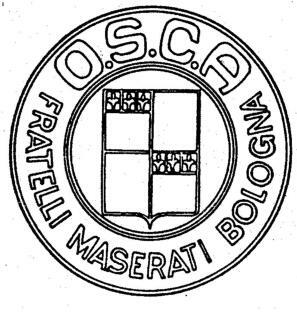 Not long after the war was over, they decided their real interests lay in racing, and together they formed OSCA--short for the rather more cumbersome Officina Specializzata Costruzione Automobili Maserati wich was found on 1. December 1947. A variety of racing endeavors followed-- including an ambitious V12 Formula One project--but OSCAs shone in the smaller displacement classes. Frequent competitors in important races throughout Europe and America, they were driven by such notable pilots as Stirling Moss, Luigi Villoresi, and Prince Behra. While producing a wide variety of two-seat racing cars--all clothed by local coachbuilders-- OSCA was approached by Fiat to develop a larger version of OSCA's existing twin-cam engine for use in the 1500S sports car. 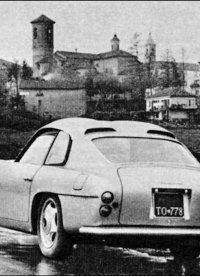 Shortly afterward, OSCA decided to offer a street car and the natural engine choice was a 1,600-cc version of the engine developed for Fiat. The job of designing the coachwork fell to Zagato. Two versions were built: a normal roof design, as well as one of the prettiest cars of the era, the so-called double bubble coupes. While certainly a dramatic styling element, the roof-top bubbles were also practical, adding inches of headroom and incorporating vents at the rear to keep cabin temperatures down during races. These cars, with their thoroughbred racing engines and nimble chassis, were among the best-looking road/race cars of their time. Even if they hadn't been created by some of the better-known and most talented automotive engineers who ever lived, OSCA sports racers would rank high in the lists of the best post- war sports cars. Building small-bore sports racers in the 750-cc, 1,100-cc, 1,500-cc, and two-liter classes, OSCAs began winning almost immediately. The high point is without a doubt the MT4 roadster, which achieved an overall victory in the 1954 12 Hours of Sebring race driven by Stirling Moss and Bill Lloyd. Many well-known drivers did extremely well with the light, fast cars, which became the most successful 1,500-cc racers ever built. Today they easily bring nearly $500,000 as gilt- edged vintage racers and guaranteed event rides. OSCAs were clothed by the leading Italian carrozzerie and most looked as good as they went. No one ever accused the Maserati brothers of not knowing how to build great cars--they just never figured out how to make it a business. It seemed quite logical to use the money from the Fiat engine deal to make a proper road car to sell in some numbers. But as so often happens with small manufacturers, the timing wasn't quite right. Since OSCA was best at racing, it made sense that the new 1600 GT would also take to the track to enhance its reputation in the showroom. The 1600 GT was bodied by five different coachbuilders, with the most attractive and numerous being that of Zagato. With four-wheel disc brakes, fully independent suspension, strong and light ladder tube frame, a smooth, flexible engine, and clothed in the iconic "double bubble" body, it should have been everything needed for success in racing and on the road. Unfortunately, problems with homologation for both the track and street meant that deliveries were delayed almost two years. Although over a hundred examples were built, it never achieved the competition results expected and drove the company to the brink of closure. In 1937 the Maserati brothers sold their company to industrialist Adolfo Orsi. Not long after the war was over, they decided their real interests lay in racing, and together they formed OSCA- -short for the rather more cumbersome Officina Specializzata Costruzione Automobili Maserati wich was found on 1. December 1947. A variety of racing endeavors followed--including an ambitious V12 Formula One project--but OSCAs shone in the smaller displacement classes. Frequent competitors in important races throughout Europe and America, they were driven by such notable pilots as Stirling Moss, Luigi Villoresi, and Prince Behra. While producing a wide variety of two-seat racing cars--all clothed by local coachbuilders--OSCA was approached by Fiat to develop a larger version of OSCA's existing twin-cam engine for use in the 1500S sports car. Shortly afterward, OSCA decided to offer a street car and the natural engine choice was a 1,600-cc version of the engine developed for Fiat. The job of designing the coachwork fell to Zagato. Two versions were built: a normal roof design, as well as one of the prettiest cars of the era, the so- called double bubble coupes. While certainly a dramatic styling element, the roof-top bubbles were also practical, adding inches of headroom and incorporating vents at the rear to keep cabin temperatures down during races. These cars, with their thoroughbred racing engines and nimble chassis, were among the best-looking road/race cars of their time. Even if they hadn't been created by some of the better-known and most talented automotive engineers who ever lived, OSCA sports racers would rank high in the lists of the best post-war sports cars. Building small-bore sports racers in the 750-cc, 1,100-cc, 1,500-cc, and two-liter classes, OSCAs began winning almost immediately. The high point is without a doubt the MT4 roadster, which achieved an overall victory in the 1954 12 Hours of Sebring race driven by Stirling Moss and Bill Lloyd. Many well-known drivers did extremely well with the light, fast cars, which became the most successful 1,500-cc racers ever built. Today they easily bring nearly $500,000 as gilt-edged vintage racers and guaranteed event rides. 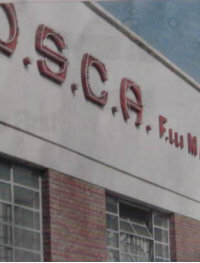 OSCAs were clothed by the leading Italian carrozzerie and most looked as good as they went. No one ever accused the Maserati brothers of not knowing how to build great cars--they just never figured out how to make it a business. It seemed quite logical to use the money from the Fiat engine deal to make a proper road car to sell in some numbers. But as so often happens with small manufacturers, the timing wasn't quite right. Since OSCA was best at racing, it made sense that the new 1600 GT would also take to the track to enhance its reputation in the showroom. The 1600 GT was bodied by five different coachbuilders, with the most attractive and numerous being that of Zagato. With four-wheel disc brakes, fully independent suspension, strong and light ladder tube frame, a smooth, flexible engine, and clothed in the iconic "double bubble" body, it should have been everything needed for success in racing and on the road. Unfortunately, problems with homologation for both the track and street meant that deliveries were delayed almost two years. Although over a hundred examples were built, it never achieved the competition results expected and drove the company to the brink of closure.